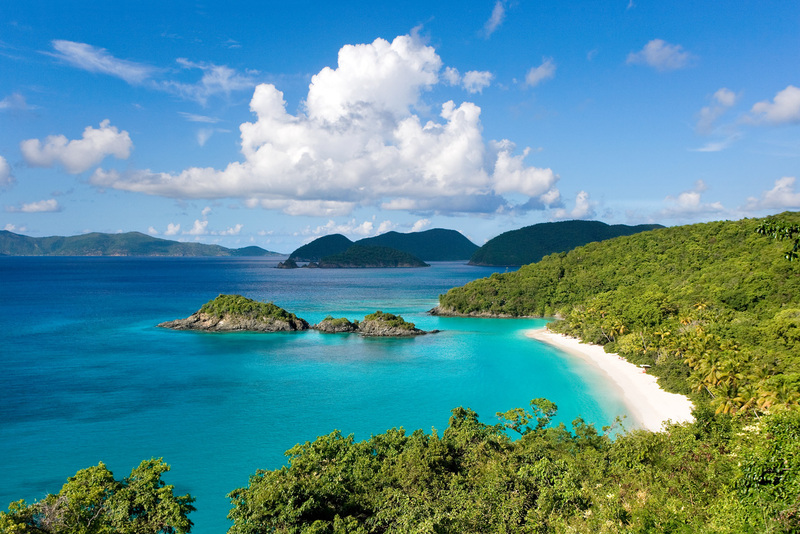 St. John is the smallest of the three main US Virgin Islands. As such, it is located in the Caribbean Sea. The Virgin Islands as a group are located between Florida and South America. They are 1106 miles southeast of Miami and 40 or 50 miles east of Puerto Rico. The US Virgin Islands are slightly southwest of the British Virgin Islands. The US Virgin Islands have been described as having perpetual summer weather, and they don’t experience much in the way of seasonal changes. The summer months of June, July and August tend to be the hottest with temperatures in the mid-80s Fahrenheit. In the “winter,” from December to February, air temperatures usually dip down to the mid or high 70s, but the lowest recorded temperature on St. John Island was 55 degrees during March, 1991. Water temperatures are similarly stable: They are around 79 degrees during the winter and 83 degrees during the summer. The difference between the average coolest winter day and the average hottest summer day in a year is a meager 18 degrees — which isn’t much more than the difference between the average minimum and maximum temperatures during any of the winter months. For example, the minimum temperature during January is 70 degrees, while the maximum temperature is 84 degrees. February has an identical temperature range, while temperatures during December can range from a minimum of 71 degrees to a maximum of 85 degrees. The US Virgin Islands do not have a rainy season per se. February and March tend to be the driest months, while May, August, September, October and November tend to be the wettest. Even during the wet months, rain is generally not a constant, all-day affair. The wet months simply get a lot of short rain showers that usually take place at night or in the early morning. A rainy day is one that gets multiple showers throughout the day. On average, St. John gets a little more than 45 inches of rain per year. In 2003, it experienced a deluge of 18.9 inches. In general, though, droughts tend to be more of a problem than massive rain showers. While hurricanes can be a major threat in the Caribbean, hurricane season in the Atlantic Ocean and Caribbean Sea lasts from June 1 to November 30, with most storms taking place during August and September. So, if you are planning a vacation to St. John in the U.S. Virgin Islands, it really is appropriate to visit any time of the year. If you are looking for a place to stay while on vacation and the resort life isn’t for you, consider staying in a luxury vacation rental home or villa from CimmaronStJohn. They offer a wide variety of rentals with beautiful views and wonderful accommodations and amenities.